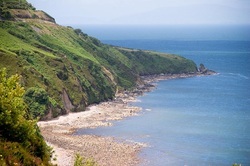 Depart from USA and travel overnight flights to Dublin, Ireland. Arrive in the morning and hit the streets sightseeing. 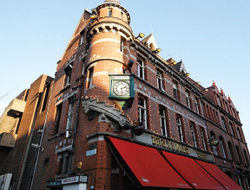 A City Tour to orient you to this “Fair City” will include statue lined O’Connell Street, elegant Georgian squares, a visit to Oscar Wilde’s Trinity College, holder of the 1200 year old Book of Kells and the magnificent Old Library, and St. Patrick’s Cathedral. Check into hotel for a 2-night stay, welcome dinner at the hotel. This morning after breakfast, head south to beautiful Wicklow County. Arrive at the majestic Powerscourt Estate and it’s beautiful gardens. It now houses the Avoca Shop of fine woolen items and Irish crafts. Lunch on own at Avoca restaurant before continuing to the beautiful and historic village of Glendalough. 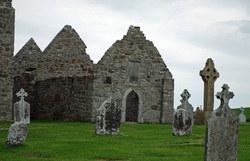 It was here in the 6th century, that St. Kevin founded his monastery. 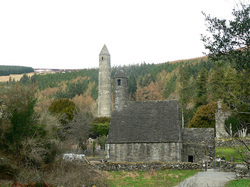 Audiovisual Ireland of the Monasteries followed by tour of the ruins. Return to Dublin. Dinner at one of the local pubs. 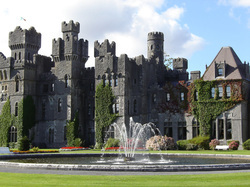 Visit the famous Waterford Crystal Company with a chance to buy souvenirs. 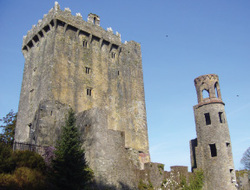 Afterwards we will see the Blarney Castle, the famous “kissing stone”, and the Blarney Woolen Mills. From here continue to the pretty riverside town of Cobh. It is from this port that many thousands of Irish emigrants left for the new world. 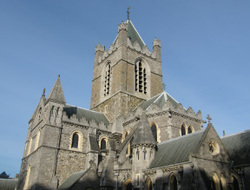 Visit the Heritage Center and St. Coleman’s Cathedral. Continue on to Kerry for overnight and evening dinner. Breakfast at the hotel and then the famed “Ring of Kerry”. This 100 mile land and sea panorama has plenty of spots for those picture moments. Back in Killarney, the group will travel through the national park via an enjoyable horse-drawn Jaunting Car Ride. This evening dinner and perhaps time to enjoy the pubs for some local entertainment. 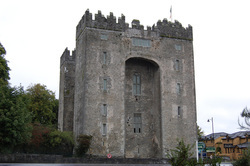 Depart for Galway passing through Bunratty Village, have lunch on own and visit this 900 year old castle, and stroll through the Folk Park that depicts Irish life in the early 1900’s. Pass through the quaint village of Adare. Enjoy dinner in a local bar or restaurant. Overnight in Galway. After breakfast this morning depart for a day trip of the scenic Connemara area. The first stop is Kylemore Abbey. This massive, precious heirloom castle is run by the Benedictine nuns. Continue to the tiny town of Cong—home of the Ashford Castle and the whole town is the set of “The Quiet Man”. If there is time we can go on to Croagh Patrick Visitor Centre. 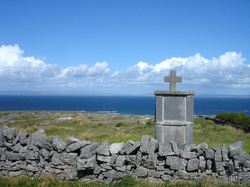 This is located at the foot of St Patrick’s Holy Mountain in Murrisk. Before heading back to camp, this evening’s dinner will take place at the Dunguaire Castle. Overnight in Galway. After breakfast this morning, board a coach to Rossaveal, and then a 45 minute ferry ride to Inishmore, the largest of the Aran Islands. Much of these islands is as it was in the past, many catholics fled here during Cromwell’s conquest of Ireland in the mid-17th century. This will be a very interesting day with a local guide. Before leaving the island, visit the clifftop Dun Aengus—a dramatic and spectacular prehistoric stone fort. Return to the mainland. Dinner on own in one of the many interesting pubs. Overnight in Galway. Breakfast this morning and then motor to Rathbaun Farm, you can try your hand at scone making and learn about sheep shearing and dog whistling. After a spot of coffee and fresh scones, head west across the desolate limestone plateau—The Burren. At the Burren Center you will learn of the time when this area lay beneath the sea. 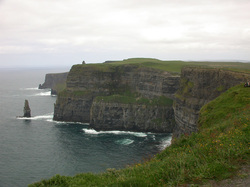 After lunch, continue to the famous Cliffs of Moher. These cliffs rise over 660 feet above the Atlantic Ocean. From O’Brian’s Tower, the Moher’s highest point you have fantastic views of over 100 miles in each direction. Return to Galway. Dinner this evening at one of the local pubs. Our first stop is The 12th Century Athlone Castle. From here we step back 1,200 years and join the Vikings on a replica Viking Ship. Cruise down river to the monastic settlement and round tower of Clonmacnoise (1hr 30min one way). Hear of the escapades on these waters through live commentary on Viking battles and tales of buried treasure. After lunch, continue on to ancient Galway for a tour of the city and dinner in town. Overnight in Dublin. After breakfast this morning, check out of the hotel and board coach en route to the airport. Arrival in the US on the same day, with lots of new friends, memories, and pictures to share.